It’s been an unfruitful gardening season this year. It’s high summer and I have not one tomato growing, unlike the bounty of years past. 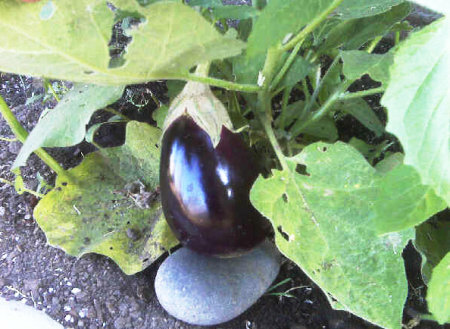 This beautiful eggplant makes up for the lack of other vegetables though. The grasshoppers are feasting on the garden plants, leaving ragged holes in the leaves and spreading little viruses as they move from plant to plant. If only I enjoyed eating grasshoppers, then there might be some equality in this ecology. We never had eggplant at home. I remember that it was mentioned in one of the Ramona books I loved as a kid. I was so confused by it. I still don’t know any good eggplant dishes. I’m sure I could look one up… but eh.